Glenbard North High School's Justin Jackson evades a would-be tackler. Jackson, who rushed for 3,171 yards and 38 touchdowns his senior year, is the back-to-back Gatorade Illinois Football Player of the Year. Glenbard North running back Justin Jackson committed to Northwestern before coach Pat Fitzgerald or any of his staff knew. Jackson was in the car with his father on the way to visit Iowa in late April when they engaged in a conversation about how Jackson wanted some good looking gear from whatever college he went to. He paused and looked at his dad. Freudian slip or not, his fate was sealed no matter where that car was driving on that April day. Jackson knew he was Evanston bound and that on National Signing Day, his journey would stop at Northwestern. As an NU recruit, you know you’re in good shape if your GPA is higher than your 40-yard dash time. For Jackson, his GPA (5.0) blows his 40 time (4.45) out of the stadium. Education has always been a big part of Jackson’s life thanks to his parents, his father is an engineer and his stepmother is a forensic scientist. But the senior wants more than to just do well in school – he wants perfection. Finding the right college, not just on the football field but in the classroom as well, came to the forefront his junior year. By then, he also noticed all the recruiting attention he was receiving from coaches so he knew the opportunity to get a scholarship to play football would go hand-in-hand with his search for a good education. When Glenbard North head football coach Ryan Wilkens saw Jackson his freshman year, Wilkens knew he had someone special on his hand. Jackson wasn’t an immediate impact player on the field, at least at running back, but he was already developing into a solid cornerback, and during his sophomore year, he shared carries with his brother, Phil Jackson II. But even that wasn’t until the end of the year. Jackson, a self-professed numbers guy (he wants to be either an economics or finance major), let his stats do the talking in 2012. The then-junior ran for 2,612 yards on 421 carries and scored 35 touchdowns. For the math majors at home, that’s 6.2 yards per carry and one touchdown every 12 rushes. He led his team to the Class 8A state championship game and a 12-2 record on the year. To top it off, he was named the 2012 Gatorade Illinois Football Player of the Year. Schools came sprinting to Glenbard North to see “Superman,” as some recruiting analysts called him, take flight. But with the eyes of college football coaches from across the nation on him, what would he do for an encore performance, knowing every defender would be targeting his red cape? If anything, the pressure was on the defenses that tried to contain him. Jackson soared to new heights in 2013, not only duplicating his stats but surpassing them. He rushed for 3,171 yards on 328 carries and scored 38 touchdowns. He was able to rush for over 500 yards more with almost 100 fewer carries. He took home the Gatorade Illinois Football Player of the Year award again. The first time Jackson interacted with NU coaches was brief and coincidental. He was a freshman at the time when the Cats went to Glenbard North to see his brother. After they talked with Phil, running backs coach Matt MacPherson called over the younger Jackson. “We’ll be back for you,” MacPherson told Jackson. As Jackson got older, offers continued to pile up from coast to coast during his junior year. But Jackson, who grew up an Illinois fan, always remembered NU, the first team that started looking at him. Finally in the summer of 2012, Jackson got what he was looking for. He and his father were in Fitzgerald’s office in June when the head coach gave it to them straight: He was extending a scholarship offer to be a part of NU’s football team — and the university. A year later on the way to Iowa, NU was still all over his mind. Not only did Jackson know in his heart he was a Wildcat, but Fitzgerald knew it too. Jackson wanted to give the process justice, however, so he had open ears to other schools that were interested in him. But on a May morning just before he was supposed to leave with his dad to visit his childhood team, Illinois, Jackson told his dad he felt his recruitment was over. Most incoming freshmen for Fitzgerald redshirt their first year, which doesn’t concern NU’s newest running back. In fact, he plans on using his likely redshirt year to learn from returning senior running back Venric Mark. Jackson’s long-term goals, however, only include a sprinkle of what could potentially happen on Ryan Field. Instead he’s focused on his internal growth outside of the stadium. “I just want to become a better person,” he said. “I want to become a better man. I’d like to use football as a vehicle to better things, whether that’s the NFL or whether that’s using my degree to my advantage. Still, he wouldn’t mind if he continued to have success running the ball in front of NU fans. Jackson, who spent National Signing Day in Arlington, Texas, playing for Team USA in the 2014 International Bowl, joins a stellar recruiting class compiled by Fitzgerald. 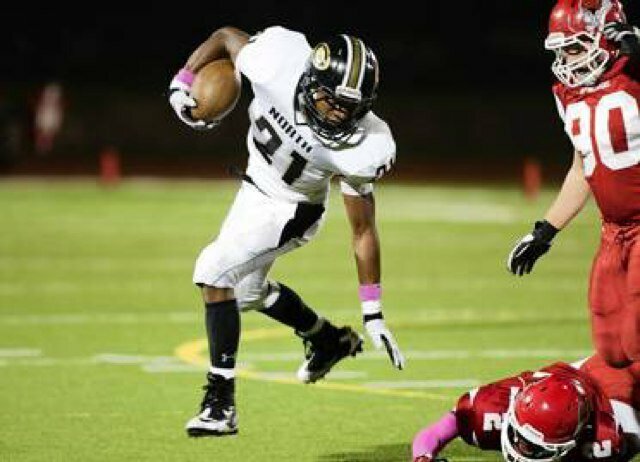 To the star Glenbard North running back, coming to NU is all about being part of a family and when he faxes in his Letter of Intent on Wednesday, he will feel relieved to finally belong to one school.